This paper presents a new map representing the structure of all of science, based on journal articles, including both the natural and social sciences. Similar to cartographic maps of our world, the map of science provides a bird’s eye view of today’s scientific landscape. It can be used to visually identify major areas of science, their size, similarity, and interconnectedness. In order to be useful, the map needs to be accurate on a local and on a global scale. While our recent work has focused on the former aspect,1 this paper summarizes results on how to achieve structural accuracy. 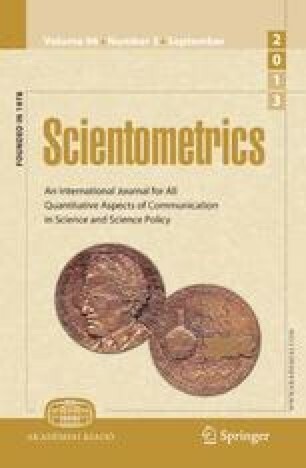 Eight alternative measures of journal similarity were applied to a data set of 7,121 journals covering over 1 million documents in the combined Science Citation and Social Science Citation Indexes. For each journal similarity measure we generated two-dimensional spatial layouts using the force-directed graph layout tool, VxOrd. Next, mutual information values were calculated for each graph at different clustering levels to give a measure of structural accuracy for each map. The best co-citation and inter-citation maps according to local and structural accuracy were selected and are presented and characterized. These two maps are compared to establish robustness. The inter-citation map is then used to examine linkages between disciplines. Biochemistry appears as the most interdisciplinary discipline in science.